The free exercise program that is part of a healthy lifestyle basically consists of two parts, daily cardio and a daily workout with one day off for rest. If you don't do much exercise now, it may seem like much. But have faith, once you get into the daily routine, you will love how you feel and look, and you will enjoy and look forward to your healthy escape from the daily grind. Give this free fitness program a try for a month and see the results. As always, consult with your family physician before undertaking a new exercise program. Daily cardio does amazing things for our bodies. Along with the healthy eating plan on this website, it helps to ensure more calories are burned daily then taken in; burning calories and fat off our bodies. It also does a world of good for our bodies moving parts and our organs, helping us stay in good shape and slowing the aging process. This free workout plan incorporates an appropriate amount of cardio in your routine. The cardio can be anything you enjoy doing that raises your heart rate for a range of 30 to 45 continuous minutes. A few examples are: rollerblading, running, swimming, biking, walking, aerobics, dancing, stepper, treadmill, elliptical, pilates, etc... Cardio also conditions our bodies muscles. Many like to do their cardio and workout at different times of the day, giving a bit of rest in between them. Daily Workout:The daily workout part of the body conditioning, shapes our bodies as we desire and helps maintain good health. This is the part that gives you the 'beach body' and keeps the body strong. 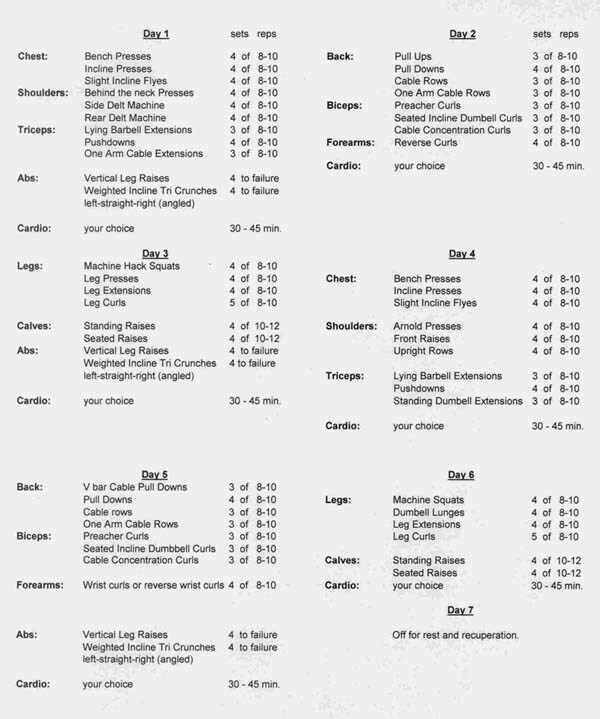 Below is the basic workout. Done correctly, along with the healthy eating plan, it is proven to be effective in sculpting the body. If you are concerned about becoming too muscular, just increase the reps to 15. It is beyond the scope of this page to detail the correct form for each movement, but your local bookstore or gym will have fitness instruction on the proper technique which is of supreme importance to be effective. We hope you enjoy this free workout routine.